Did you know that many of the problems and predicaments people suffer in life can actually be avoided? However, we see a vast majority of humanity wallowing in their own self-inflicted miserable situations. Why do people endure so much unnecessary hardships when all it actually takes to avert them is the simple application of just a little FORESIGHT? In this article, we unveil a simple technique that can save you tons of lost money, headaches, heartaches, and even lives. One of the fundamentals of logical thinking is in the heart of almost every programming language: it is called the “if-then” statement. IF I fail to wake up early tomorrow morning, THEN I will miss my 7AM flight at the airport. SO I should set my alarm clock before I go to bed tonight. We actually hear such voices in our heads very often, yet dismiss and ignore them – only to reflect in regret later on how we could have had avoided a costly problem from occurring. IF I buy the latest cell phone now, THEN I will not have enough to pay the rent. SO I should just wait and save a little every month until I come up with the amount. This ability to think with simple IF-THEN statements is key to making wise problem-averting decisions. It’s basic common sense – logic that everyone in his/her right mind would do. But it seems there is a wide shortage of common sense nowadays. It has become quite rare in many societies plagued with socioeconomic ills. God actually planted the voice in every person: the voice that generates IF-THEN statements in our heads. People call it various names like the mind of Christ, common sense, basic logic, or conscience. But the key is to keep ourselves from shutting off this fountain of wisdom. Start listening to the voice and practice imagining IF-THEN scenarios on the fly during work, while riding on a bus, and during in our idle times (one of the best ways to redeem lost time). IF I eat an entire bag of chocolates, THEN most of the calories I won’t burn will go to belly fat. SO I should just eat 2-3 pieces. IF I procrastinate in studying for my upcoming exam, THEN I will have to cram and stay late on the eve of it (resulting in poor memory retention and eye bags). SO I should allot an hour everyday to review and practice. IF I drive on the freeway while feeling drowsy for lack of sleep, THEN I can cause a tragic accident involving loss of life and property. SO I should just pull over and get a nap at the next rest area. IF I start the meeting on time, THEN attendees will not come late next time, ELSE attendees will assume it’s fine to come late in future meetings. God looks at the heart. Eventually, we will have to face our Maker on judgment day during which our works will be weighed based on the motives behind them. IF I help the poor, THEN I will ensure their votes during the next elections. IF I help the poor, THEN I will keep them from being led into criminal activity. Two very opposing motives can be behind the same good work. Humans are unable to judge other people’s motives. But we must check ourselves if we truly are doing things out of genuine pure motives. 3 G’s (Gold, Glory, Girls) or 3 W’s (Wine, Women, Wealth) could be the motives driving our the internal IF-THEN statements of the heart. Don’t let your works burn down to ashes on judgement day. 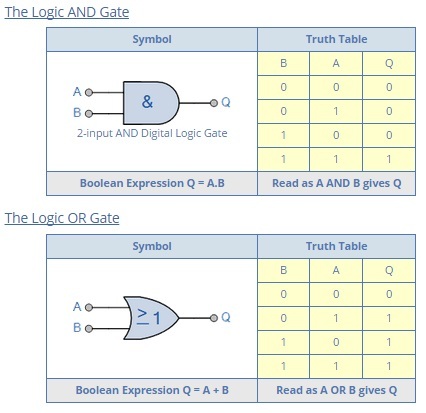 Computer microchips and programs run on logical building blocks called logic gates. IF [input B is 0 and input A is 1], THEN the gate’s output Q will be 0. 1/0 can stand for any two states such as ON/OFF, TRUE/FALSE, or HIGH/LOW. Computers make decisions in this very deterministic predictable manner. This is why they can be trusted to give reliable results. Unlike computers, humans tend to change their logical look-up tables through time and based on the factors at hand like time of day, mood, or environment. Aside from setting good logic IF-THEN statements to live by and ingrain as a habit, another key is to being consistent to live by them independent of the situation. There was this failed police operation that occurred recently resulting in the deaths of several dozens of police officers. In retrospect, when people begin to start the blame game, we realize how the failure is shown to be rooted in the lack of basic IF-THEN logic (aka Common Sense). IF we retreat through this open field, THEN the enemy forces can easily pin us down from the nearby foliage with trees as their cover. Unfortunately, unable to receive back-up due to another failed lack of IF-THEN logic on the side of the officers in charge, the entire unit was wiped out. Try simulating IF-THEN scenarios now and begin to see the difference in your home, work, church, and relationships. IF we apply IF-THEN logic to small mundane tasks, THEN we can be trusted to make wise decisions in our larger roles. The biggest IF-THEN that everyone has to settle is this: If I don’t enter by the Narrow Gate (Jesus Christ) and the straight path that leads to life, I will end up suffering in hell (lake of fire) for all eternity after I die. That’s the dumbest mistake any soul can ever make – and yet a lot of “smart” people are in hell now crying in woeful regret. May that not be your story. Repent guys while you still have the chance (while that beating heart is still ticking). Time is fast running out.